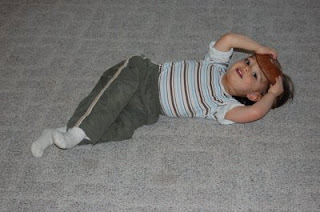 potterknitter: But Wait, Wait there's more! I finished up a long overdue pair of socks last week. These are the Slippin Stripping socks from last year's Sock Madness competition. They are the third round socks and of course the round I got knocked out on. 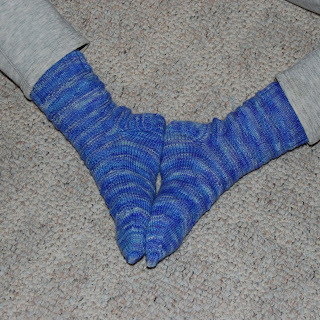 They are knit with double strands of laceweight yarn from Tess' Designer Yarns. No self stripping for us. 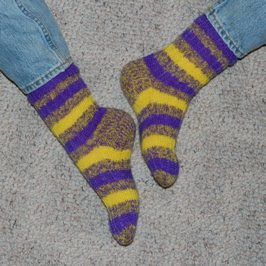 I was anxious to finish them up and free up some needles since Sock Madness 3 was beginning. Last Thursday morning the round 1 pattern arrived in my email. I finished the pair this Thursday evening. One week and half a day. Not bad around here since I spend much of my knitting time standing at the dining room table watching to be sure the kid doesn't jump off something. I'll be a contestant on Wait Wait Don't Tell Me on NPR this weekend! I'm only a little nervous. OK since it was taped last night I'm only a little nervous to hear it on air, last night I was a lot nervous. OH MY GOD!!!! that is my fav weekend NPR show. i cannot wait to hear you. i feel like i know a star now. That's so cool! I just started listening to that. I look forward to the podcast. Hey there! I came over from Katydid Knits Blog and saw her yarn bowl. I was wondering if I can custom order one from you? That would be GREAT! Let me know!